Optimize your work process with integrated development tools. Remote System Explorer connects with IBM i servers to search and manage server-side files and run server scripts. Language-aware source editing capabilities include color tokenizing, outline views, content assist and integrated compile error feedback. Visual analysis tools assist in understanding application structure and dependencies. 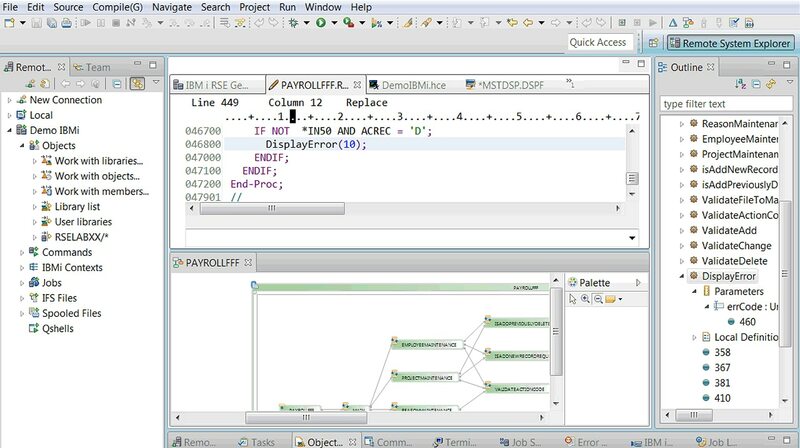 Reduce training time with a modern Eclipse-based development environment when working on heritage RPG and COBOL applications. Rational Developer for i supports a range of programming models and languages including Java® , Java EE, C/C++, RPG, COBOL, CL and DDS. Enjoy a common user experience across other Rational IDEs for IBM Z® systems, AIX® and Linux® . Use Rational Team Concert, a lifecycle management software that supports remote-based teams. Enable source control, build automation and collaborate on lifecycle management projects using a common platform that includes agile, formal, and hybrid planning and reporting. Choose the purchase option that is right for you. Purchase it with: COBOL Tools; COBOL + Modernization Tools, Java Edition; or COBOL + Modernization Tools, EGL Edition.